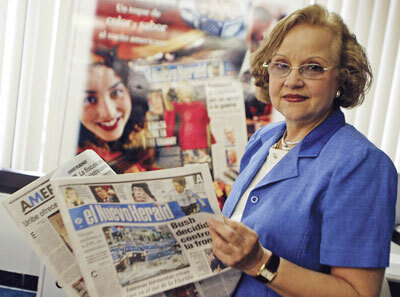 Eileen Rodriguez, executive secretary to el Nuevo Herald Executive Editor/Director Humberto Castelló, is a bit like the secretary general of the United Nations. She deals with consuls general, ambassadors, representatives of international corporations and journalists from many countries. A Spanish-language daily published in Miami, el Nuevo Herald has an international audience unlike that of most U.S. newspapers. Although Miami is well-known for its large Cuban community, the area is also home to thousands of people from countries in Latin America and the Caribbean, all of which are part of the paper’s target audience. Rodriguez’s background has elements in common with many of el Nuevo’s readers and journalists. She came to the United States from Cuba in 1960 and is fluent in both English and Spanish. (She estimates that at least 75 percent of her work is conducted in Spanish.) She attended school in the United States and has lived in Puerto Rico, Venezuela and Mexico. Before coming to el Nuevo in 1998, Rodriguez held various positions at The Miami Herald and in Knight Ridder’s corporate offices before the relocation to San Jose. She has served as an assistant to directors of circulation, community relations and corporate communications. Rodriguez also has a talent that is appreciated by many visitors to Castelló’s office: She can brew a delicious cup of Cuban coffee. She stresses that being in charge of the cafecito is not demeaning to her but a way of showing hospitality to guests of the newspaper. Those guests have included Florida’s governor, Jeb Bush; the governor of Puerto Rico; foreign ambassadors; the heads of U.S. companies trying to reach a Hispanic audience; and the late salsa singer Celia Cruz and her husband.